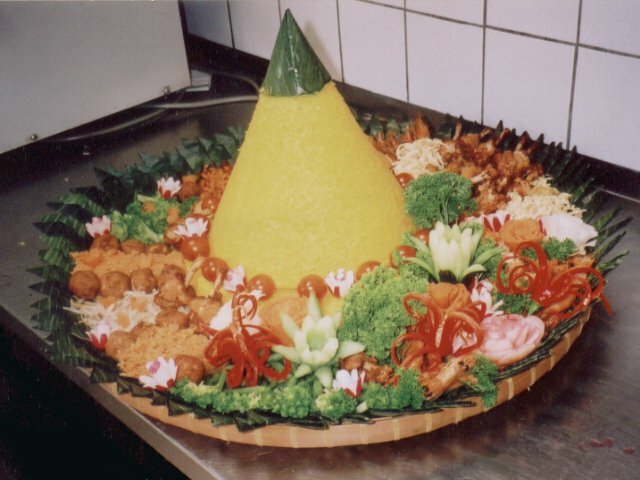 Tumpeng is a cone-shaped rice dish like mountain with its side dishes (vegetables and meat). The cone shape of rice is made by using cone-shaped weaved bamboo container. The rice itself could be plain steam rice, uduk rice (cooked with coconut milk), or yellow rice (uduk rice colored with turmeric). Left: Tumpeng, the cone shaped rice surrounded by assorted Indonesian dishes. The rice is usually surrounded by assorted of Indonesian dishes, such as urap vegetables, fried chicken, empal gepuk (sweet and spicy fried beef), abon sapi (beef floss), semur (beef in sweet soy sauce), teri kacang (anchovy with peanuts), fried prawn, telur pindang (boiled marble egg), shredded omelette, tempe orek (sweet and dry fried tempeh), perkedel kentang (mashed potato fritters), perkedel jagung (corn fritters), sambal goreng ati (liver in chilli sauce), and many other things. Traditionally there should be a balance between vegetables, meat, and seafood. People in Java, Bali and Madura usually make Tumpeng to celebrate important events. The philosophy of Tumpeng is related to the geographical condition of Indonesia, especially Java as a fertile island with numerous mountains and volcanos. Tumpeng dated back to ancient Indonesian tradition that revered mountains as the abode of ancestors and gods. The cone-shaped rice meant to mimics the holy mountain. In gratitude ceremony, after the people have prayed, the top of tumpeng is cut and delivered to the most important person. He or she may be the group leader, the oldest person, or the beloved one. Then, all people in the ceremony enjoy the tumpeng together. With tumpeng, people express the gratitude to God and appreciate togetherness and harmony.